Got documentation? We're not talking mere PHS paperwork here! 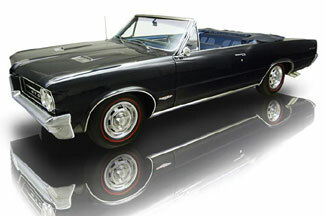 This beautiful '64 GTO convertible, the first of the breed, one of only 6,664 cars, with a ton of options and past AACA show winnings, has a paperwork collection the likes of which we rarely see here! We love to obsess over paperwork, so this car ranks highly with us! Start with the ORIGINAL build sheet from the Pontiac, MI plant�those are nearly impossible to find, and this one's mint! The original Protect-O-Plate generated at the plant follows the car along, as well. From there you can prove you're looking at the ORIGINAL drivetrain. The interior of the 1964 GTO Convertible is as nice as it is loaded. Comfy buckets, the original gauges and console, fully functional power windows, power steering, the original wood wheel and more are in excellent condition. An excellent dash, new carpet and clean door panels make this a nice place to spend miles. Underneath the 64 GTO Convertible you'll find clean panels, nice detailing and a new Gardner exhaust system. Numbers matching, clean and well sorted�what else do you want from a chassis? The story's the same in the trunk, with a proper spare, the correct jack, mat and tire cover. All that and there's plenty of room for your gear. Open the hood and check out the detailed engine bay full of hard-to-find parts. The power steering pump, the accessory brackets and the pulleys are all '64-only pieces which can bring down an otherwise nice restoration�again, this low mileage, untouched car is correct. Proper chrome pieces from the air cleaner to the valve covers add sparkle while the inner fenders are uniformly satin black. Rebuilt brakes, clean fluids, Packard wires and more look the part and do what they should.